Bladen County: 156 permitted swine farms, 30 of which are in or touching the 100-year flood plain and floodways. Note: This is the second in a series of posts this week about the state’s swine farm buyout program, which is being revived after an 11-year hiatus. The coverage will include maps of more than a dozen counties and the locations of their flood plains and hog farms. See yesterday’s post for a primer on how the program works. These maps were built using open-source software, QGIS, and are based on DEQ’s list of animal feeding operations, FEMA flood plain maps and county overlays to indicate locations of cities and towns. It’s not a coincidence that some of the areas hit the hardest by Hurricane Florence are low-lying regions that sit on sandy soil in the Coastal Plain. The highways and county roads seem to sit right on the water table. Nor is it a coincidence that industrialized livestock operations, particularly swine farms, are also located here. As tobacco dried up as a major source of farming income, and other major manufacturing industries went abroad, giant hog farms filled the vacuum, some with 5,000 — even 10,000 — head of swine. But swine farms and flooding don’t mix. After three hurricanes hit North Carolina in 1999, flooding the open waste lagoons, turning waterways into fetid baths of feces, the state started the Swine Farm Buyout Program in order to remove the most vulnerable farms from the areas most prone to flooding. The Federal Emergency Management Agency, commonly known as FEMA, designates 100-year and 500-year flood plains. A 100-year flood plain is classified as an area where there is a 1 percent chance of annual flooding. FEMA considers a 500-year flood plain as where the chance is 0.2 percent. This information is not only important for local emergency managers, but also for insurance companies, which adjust rates (or deny policies) on structures in those areas. 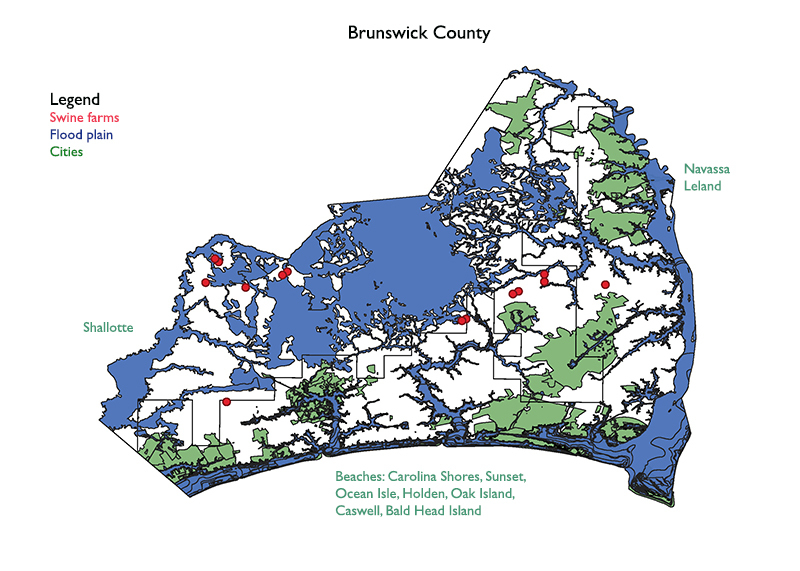 Eleven of 15 of swine farms located in Brunswick County are located in or adjacent to a 100-year flood plain. 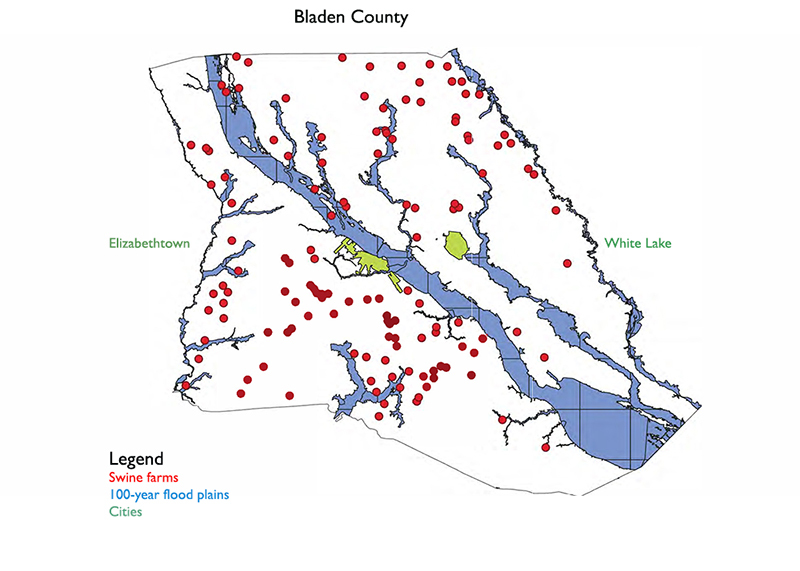 But as these maps show, many farms remain in the 100-year flood plains. There simply isn’t enough state funding, even with federal matching grants, to buy them all. In Brunswick County, for example, nearly every farm is in or touching the flood plain. 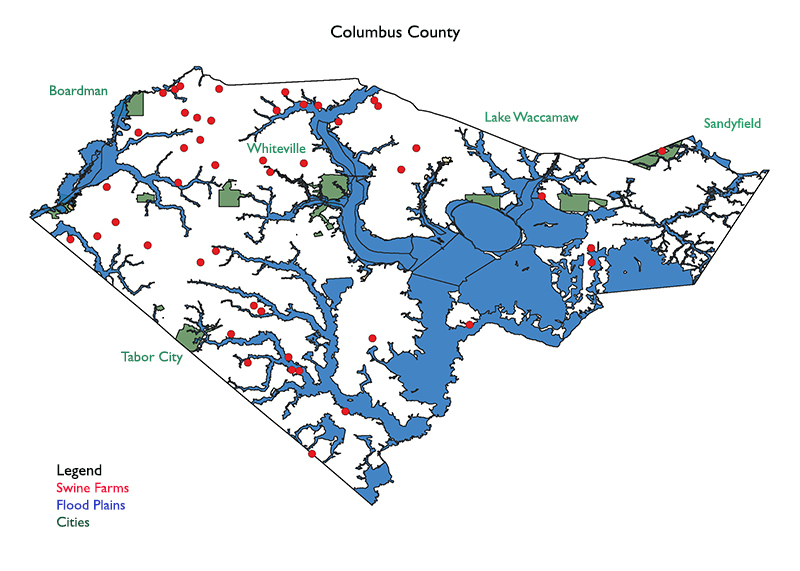 Of the 50 swine farms in Columbus County, about half lie within or near the 100-year floodplain. Also near the coast, just north of Wilmington, Columbus County is home to the fresh-water Lake Waccamaw, the anchor of a state park popular with boaters and fishers. One swine farm lies just northeast of there, in the flood plain that is a natural part of the geography. 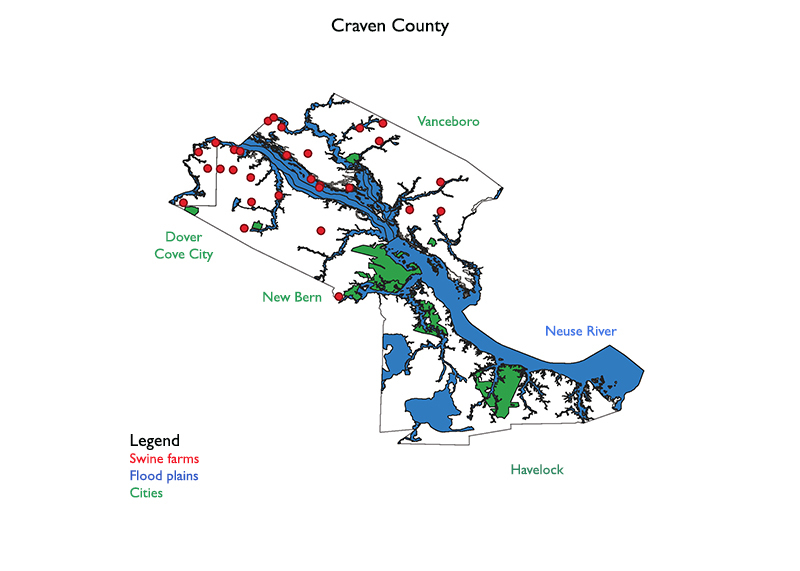 Craven County has 30 permitted swine farms, more than half of which are in or touch the 100-year flood plain. Craven County, among the areas that took the brunt of Hurricane Florence, is veined by the Neuse River. All of the hog farms lie upstream of where the river enters the Pamlico Sound and its sensitive estuaries before flowing into the Atlantic Ocean. About half of those farms are situated in flood-prone zones. I’m glad to see that we are trying to get rid of hog farms here in the flood plains. We had such weak if any EPA laws it was easy to invade our state with hog farming.